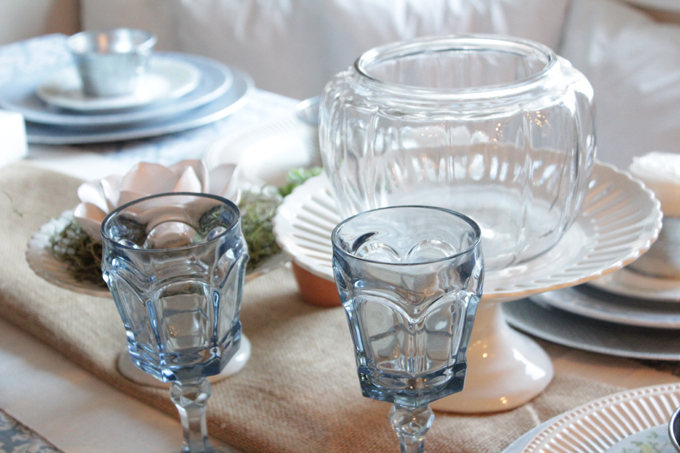 Here are a few sneak photos of what I am doing for my Thanksgiving table decor this year. I can't show too much, especially since people who are actually coming over might be viewing this, and I'd really like to keep it mostly a surprise. As I mentioned on my FB page I am doing non traditional colors this year, but with a few nods to fall. 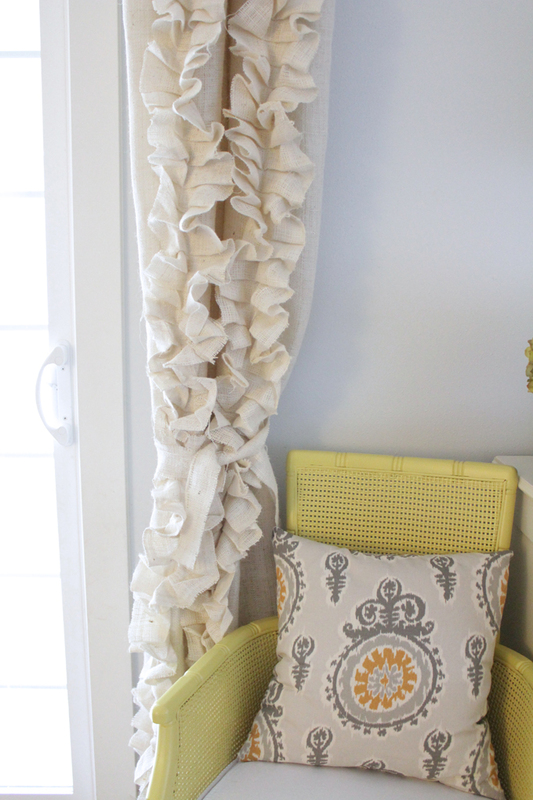 Let me just start by saying, I absolutely love how these curtains came out! I used burlap for my fabric, which ended up working out tremendously, seeing as I needed 11 YARDS and it's a cheap fabric, especially if you have a coupon. I had never used burlap before so it was a little bit of a learning curve on how to work with it. VERY important: you do not want to cut burlap on what you think is square! To get a straigth line with burlap you actually pull a string out from the weaving. When you cut burlap on a square you may think you are cutting straight, but you aren't. As I was putting my Halloween decorations away I figured a few them would still work for Thanksgiving/Fall decoration. So I took them and started decorating my table. I didn't have a whole lot of time (about 45 minutes left on baby nap time) so I needed to be quick. I looked around the house and grabbed whatever I could find that looked fall-ish. I also looked around my craft room and snagged a few things from there too. This is what I ended coming up with. 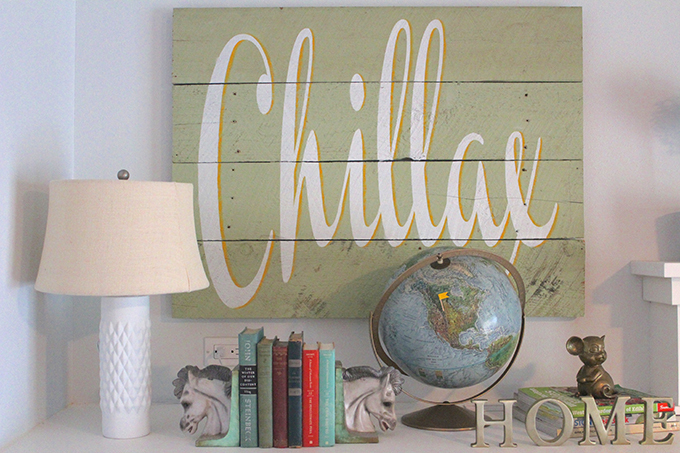 I got the inspiration for this idea when I saw a picture of another large wood sign browsing Houzz.com. My inspiration photo can be found here. When we framed our basement, we ripped out some old storage shelving, and the green planks used to make this sign were part of the shelving we removed. I really liked the color and the naturally distressed look. It's done, it's done! 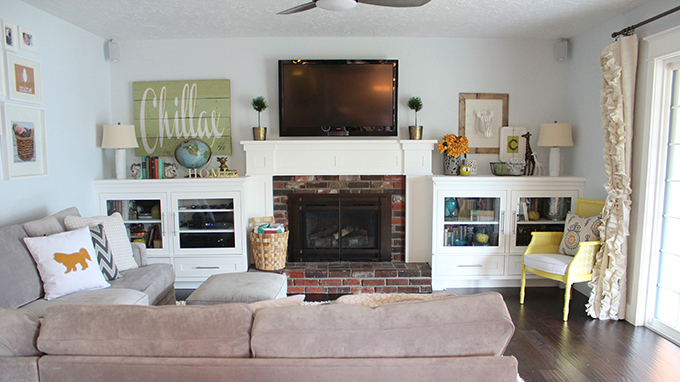 The family room is finally finished being decorated (for now at least, lol). There may be a few things that will change in the future but for now I love it just the way it is. See what it originally looked like here. There are a few things which are my particular favorites that I'll mention during the post. So without any further adieu...the REVEAL! !